The Ford Focus Electric has been tested by the National Highway Traffic Safety Administration (NHTSA) and earned a five-star Overall Vehicle Score. This rating was the result of the car’s participation in the New Car Assessment Program done by NHTSA. NHTSA and the Insurance Institute For Highway Safety (IIHS) are the two organizations that test vehicles in the United States. Both offer a comprehensive test that gives buyers an understanding of how their new car might rank compared to others like it in that class of vehicles. 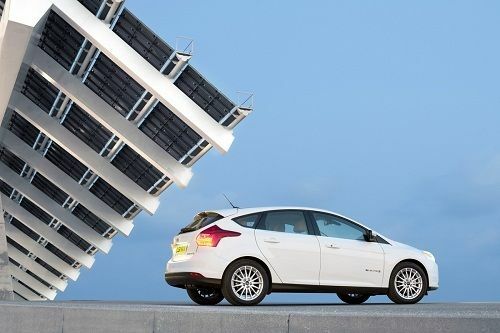 That the Ford Focus Electric is a completely modern electric vehicle, and has passed this test, shows once again that electric drivetrain equipped vehicles are just that – modern safe vehicles that just happen to not have a liquid fuel engine on board. Early in the evolution of mainstream electrified vehicles, many doubters wondered if there was more risk of fire or other types of injury from electric drive cars like hybrids, plug-in hybrids, and fully electric cars. This has not proven to be the case and many electric car advocates point our (correctly) that 15 gallons of extremely flammable liquid fuel under one’s seat is likely more cause for concern than a battery that adds 500 pounds of mass to an electric car. Like all new products any fires or other hazards that resulted from any electric car vehicle receive more than their due of media coverage. “Car crashes, no fire and nobody hurt” is not typically a lead news story. There is a difference between a car with powerful batteries on board and one that has only a conventional lead acid battery. For that reason automakers have been proactive about marking the high voltage (and high amperage) cables and areas of the electric and electrified vehicles they produce. Firemen and first responders put out fires at chemical plants, electric power generation plants, sub-stations, building high voltage panels and the like. They are full capable of handling the issues that electric drives bring to a crash site. One thing that does not get enough attention is that the size and the weight of a vehicle are important factors in a crash. The Ford Focus Electric is crash tested and ranked by comparison to other very small vehicles. It will never be as safe as a Ford Excursion, Ford F-150, Taurus, of other large Ford vehicle in certain types of crashes. Particularly if it is crashing head on into one of Ford’s massive, pickup truck variants that have their front bumper about eyeball level with the driver of a Focus Electric. However, the weight of the batteries in an electric car does help in a crash with a similar sized car with a gasoline drive. Score one (minor) point for the electric cars. For a good overview on the issue of small vehicles in a crash with a larger, click here. There is also the issue of insurance company safety ratings based on actual crash statistics. The types of drivers and the types of driving done in a particular model has a noticeable impact on how many people die in that car. Insurance companies know this and they charge more for cars that have a high crash and injury rate compared to cars in general. Since electric car buyers are generally not the six-pack on the passenger seat, power drifting though turns, type of driver, this may be on the side of these cars in that particular rating. Electric cars have matured and really the only thing they don’t have right now in terms of safety is size. Great article John and nice to see a sympathetic electric vehicle related article. I think with all the heat given to EV markers by the press, camakers have to make sure their EV are safe. Two days ago I wrote about BMW recalling its Active E cars in the eventuality its transmission might get stuck. Carmakers can afford to have their EVs painted in a negative light. They've put too much into research to drop the ball later. You're right, today's EV size, range and price might not be for everyone but then again first generation new technologies rarely are.